The landscape of so many cities and towns throughout Britain has changed dramatically since the war especially the centres containing the streets with the various individual shops sitting side by side. Wolverhampton, for example in the heart of the “Midlands’ was never a classic picture postcard town I suppose mainly through its industrial background, but it is a typical example of how buildings with character have disappeared in many rebuilding programmes. Planners and the councils endorsing their decisions, in the late 1950s through the 1960s seemed to go berserk in their passion to rebuild- and some might argue destroy- what were historic and delightful areas in which to shop. Increasing road traffic clearly they say, forced their hand – and introduced us to the pedestrian precinct, an American term if ever there was one! 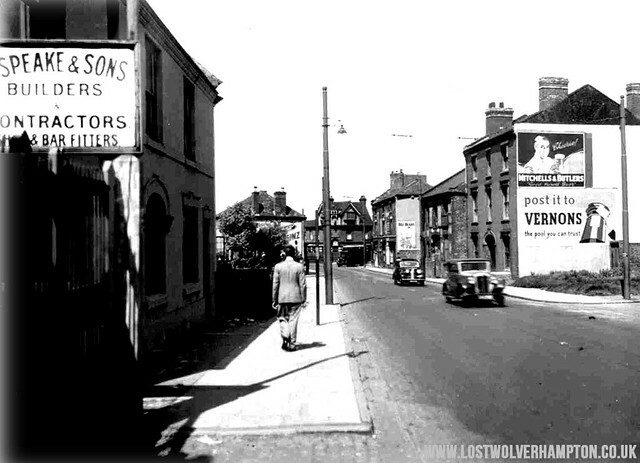 And now today in 2015, most of the Wolverhampton Street lay-out, and fine buildings that I recall from my childhood have been lost forever as you will see my following collection of pictures will show. A storm of protest met the demolition of the Elephant and Castle which stood on the corner of Cannock Road and Stafford street. It had stood on this corner for well over a century and was a controversial issue regarding plans for development – It caused a huge outcry when disappeared during an overnight demolition in April 2001. The original Elephant & Castle building dated 1890 with the old terrace adjoining it. 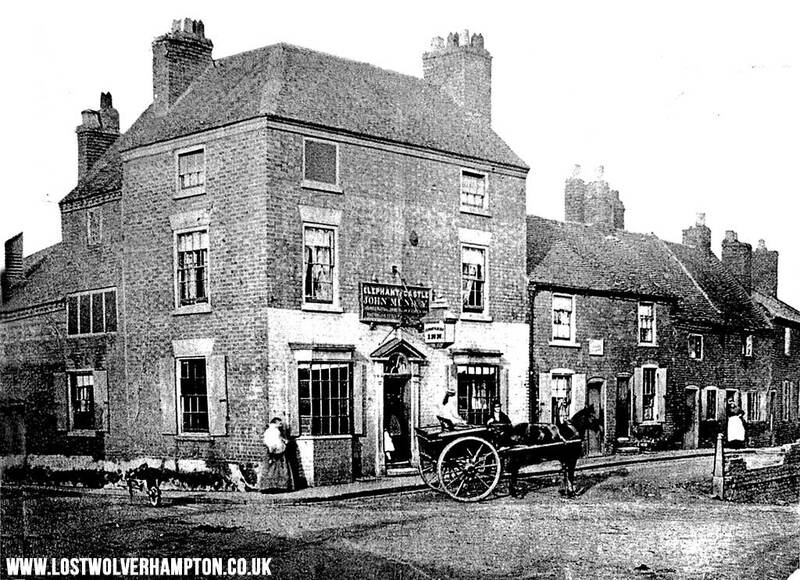 A licensed house known as Elephant and Castle had stood on the corner of Cannock Road and Stafford Street adjoining an elevated group of 25 or so small terraced houses, since at least 1868 when one Thomas Wardell was licensee. And when the new house was built at the turn of the century this sculptured Elephant took pride and place on its wonderful tiled façade. 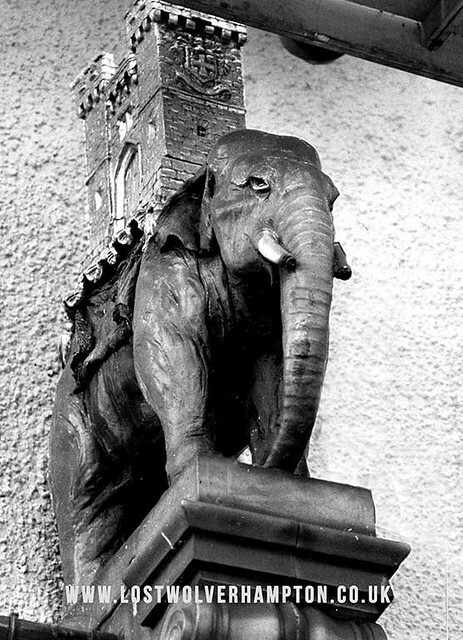 The Elephant was the second bus stop from the the top of Stafford Street for buses travelling to Low Hill, Amos Lane and the Scotlands, and I always remember as a small child during the war,gazing up at this icon with great affection. and how the back of the old trolley bus would catch on the raised causeway as we climbed aboard to travel to my aunts in Ruskin Road the Scotlands. Let me put you in the picture. What was once a thriving industrious area of town, is pictured here strangely quiet and run-down. Its the mid 1950’s and this lower end of Stafford Street is awaiting its demise in readiness for the oncoming ring road . The gentleman walking alongside Speake and Sons builders (Later Jenks Builders) on his left has just passed the top of Camp Street . Across the road facing him were the premises of Walsh Graham, Joinery Manufacturers and as I remember they had a huge fire there in the late 40’s. Back to the Gentleman walking With a few more strides he will pass “Darmody House “ The home and Surgery, of Doctor A. Byrne -Quinn, Alderman and Town Mayor in 1943. His adjoining surgery is on the corner of Crescent Row, the Heinz advert is on the side of a shop that will become Jimmy Mullen’s Sports outfitters, for a brief period before its demolition in the early sixties. 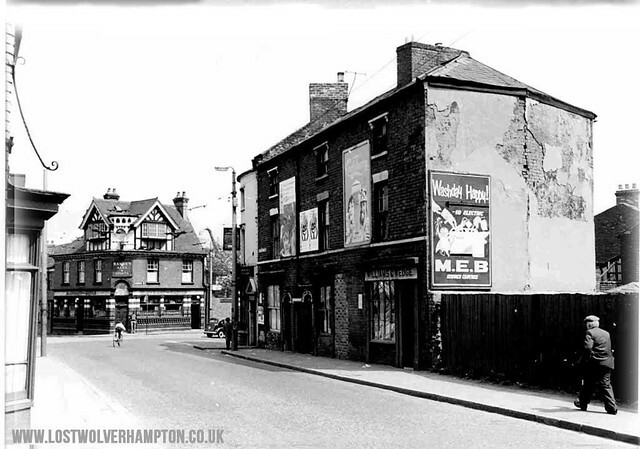 Across Stafford Street adjoining Walsh Graham just out of view on the corner of Wilson Street, is Eason’s the Barbers and on the hoarding’s above the waste ground at the top of Wilson street, are adverts for Mitchells and Butlers and Vernon’s Pools . The large Victorian building hosting the adverts was the home of Fredrick Spinks who had other properties in Wilson Street and would you believe it looking at the state of the property next door It was once the home to a dancing school. Notice here again more waste ground and on the side wall of the shops that adjoin the Junction Public House on the corner of Cannock Road.is an advert for Bile Beans. Here we see the elderly gent is approaching the run-down block of shops that adjoin the Junction pub. The advert has changed to one advertising the benefits of washing with electricity a new concept at that time. The shops that run down to the corner of Cannock Road. these shops included; Stars Fish and Chips and Williams and Wedge shoe repairs. Finally at the top of Cannock Road. we see the sign of the Junction, an Ansells Pub . Then in the centre of the picture the irreplaceable Elephant and Castle. Finally to conclude The shop window here on the left on the corner of Crescent Row, will become as I said; Jimmy Mullens first Sports Shop, Jimmy will later move a little further up Stafford Street to the former Post Office before again transferring his business to Broad Street. Epitaph by my good friend Frank Sharman. An Obituary by Frank Sharman with photo Lost Wolverhampton. 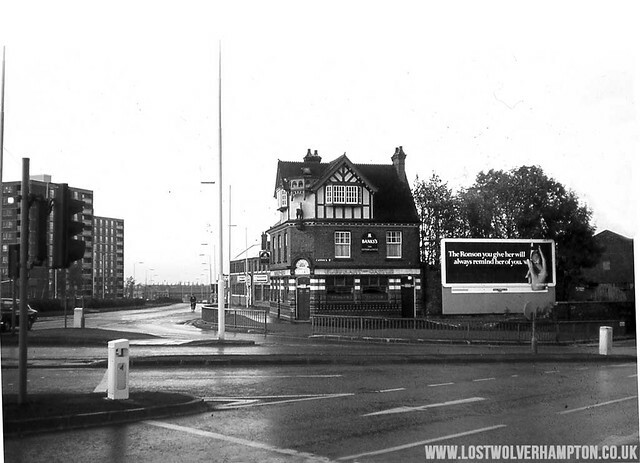 The destruction of the Elephant and Castle created greater outrage amongst the people of Wolverhampton than any other recent event in the development and redevelopment of the city. The depth of feeling was caused, at least in part, by the way in which the destruction took place. Peel Holdings sent in their death squad suddenly and without warning, not even giving time to say good bye to an old friend. The Elephant and Castle, at the corner of Stafford Street and Cannock Road, was destroyed by Peel Holdings PLC on Sunday 4th March 2001. People going by that morning saw the Elephant and Castle still in place; when they came back that evening, it was gone. A report in the Express and Star (5th March 2001) showed that even the statue of the elephant, which stood on a little bracket and under a canopy on the corner, had been destroyed. Not one stick or stone had been preserved. All that was left was part of a brick wall and a heap of rubble. Within a few days even that was gone and the site swept clear. « Wolverhampton’s “Man on the ‘Oss” is 150 years old this year. My Jones family lived in Blakenhall Wolverhampton from 1848 to 1885 before emigrating to Melbourne Australia. Prior they came from North Wales in 1847, and I still have relatives left behind in Wolverhampton and intend to track them down someday. These pics are special to me, as my relatives walked the same streets as in your photographs. and help him chopping logs etc.—fond memories of a great childhood. My grandmother used to have a shop on the corner of Cobden Street/Moore Street. Opposite was the post office and on the other corner was a veg shop. This would be around 1950. The houses were pulled down to build the flats. Does anybody know of the family Alice and Arthur Drakeley who owned the shop. Their children were Kathleen, Brenda and Bryan Drakeley. Would be great to hear from anybody who remembers this, better still have any photos….